Last month i sent out several mails to lots of people concerning a process flow change. After a week, nobody acknowledges anything and it looks like my mails went into black hole. So I asked people in my department to help me in following up and they got one similar answer – “no time to read mails”. If you dun have time to read mails, I guess I'll have to ask your bosses to read them to you then. Hubby & i went for company in-house blood test earlier this morning. His still has the silly looking face when the guy injected his arm. This is the second time we did blood test together. The first time, he was so upset cos i paid for the course without letting him know first. He has this phobia towards needle and had always refused to go for body check-up, just in case the doc might say something that he does not like to hear. His blood test result last Oct was not that good, with high bad cholesterol and high blood glucose level. It was a surprised for both of us, since hubby exercises more often than i do :P According to the doc, hubby might be having hereditary high cholesterol. Me, on the other hand, as fit as a cow, partly becos i was still breastfeeding. Will see whether there is a change on the latest test results two weeks from now. There is a newly set up mini bread stall right in front of La Boheme bakery stall at Jusco, QB, selling Buono Bread. I've not heard of this Buono Bread before but it was the price that attracted me to this stall. We got to taste some samples of original bread & oat bread fresh from toaster. The middle-aged lady who was selling this bread was very friendly and humorous too. Me : How much is the price? Me : Wow, who will buy such expensive bread? Me : Why so expensive? Me : If cannot finish then how? Lady : Export back to country of origin. We burst into laughter together right after she finished her sentence. She went on to explain why it's expensive - the ingredients are from Japan, equipment from Japan, Japanese baker....and sliced by Penang lady (meaning herself). Again, we all burst into laughter. Suddenly, i found myself reaching out money from my pocket without any persuasion. I must be under some kind of spell just by talking to her. But this will be the first and final time for me to buy such pricey bread. On the way home, i asked hubby to guess the price of the bread. A series of wrong answer given - RM3, RM5, RM7, RM12. 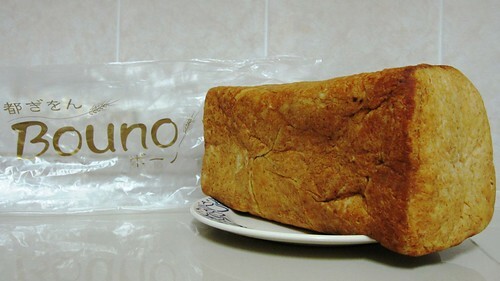 I will keep a slice of Buono bread for those who could guess the price of the bread correctly. Better be fast, this bread will expire in 2 weeks, unless i put them in the freezer (will last for a month). 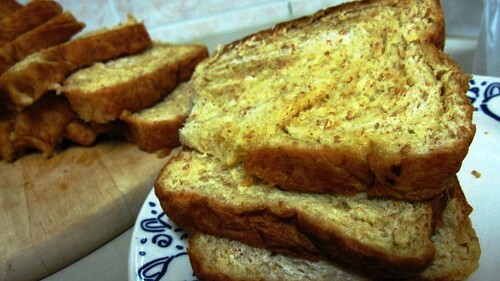 I tried to slice the bread using my normal kitchen knife, it does not look that bad, rite? You can eat this bread on its own (sounds like Gardenia). But for those who do not like margarine, you will not like this bread, the strong margarine taste will linger in your mouth after eating. 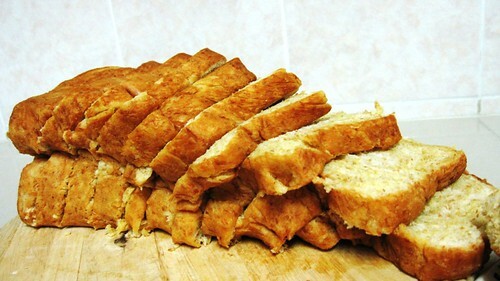 Oh yeah, nobody at home is allowed to touch this bread and it's specially for Khye. I hope he will like the nice margarine taste. I've spent the last half an hour deleting all paid posts from my blogs. I couldn't believe how many posts i've written between 2007 & 2008 and was paid quite a lot too for them all. Since i've stopped writing ads, i do not want paid posts to be "polluting" my blogs. Let's see when i start writing for money again. Till then, you will not find paid posts in all my blogs. I only know Kalimuthu case which happened in Ipoh in 199x. Kalimuthu was cornered by a group of policemen and he went amok with his gun. One of the bullets when thru the door of the car and hit the head of her cousin before landed in her chest. Her cousin died on the spot while she went into coma. Her cousin saved her life. My sis's fren told her that said before she went unconscious due to intense pain, she saw the bullet wound on the cousin's head, the size of 50sen coin. Urghh!!! I've just recovered from the toilet trip 3mins ago. Someone in one of the toilet cubicle must have eaten tons of "petai" over the weekend. The pungent smell polluted the whole toilet while she is doing her biz. The most embarassing was when the toilet cleaner shouted "Who has eaten buah petai....aiyoo!!!" And there was only 1 cubicle occuppied. Hahahaha...If i were the one in that cubicle, i will hide myself and make sure everybody leaves the toilet to save myself from such embarassment. Honestly, I really hate it when people take petai especially when the smell lingers when you're talking to the person. And the worst is the smell after that person's toilet visit. Since there is cost saving everywhere, hubby & i decided to perform some cost saving activities at home. One of them is to ride to work, instead of drive. No doubt, there are few advantages & drawbacks to ride a bike to work. - we have to be close to each other physically, so that when he decides to go full speed, i will not end up on the windscreen of the car behind us. It's a rather tiring and pathetic day for me today. First, we had to endured the haze in the morning while riding to work. Then, it's the time of the month where all girls despise. The icing of the day, i received a rather nasty mail from a counterpart, like usual. Of how this person did something since last evening and had to tell me ALL the hard work tht has been done. Afterall, i was the one who discovered the problem and logged a call. And again i was left out from the circle of mail. Although i have well trained myself to accept nasty mails from this particular person, but i just hate this person all over again. I was attracted to this phrase "Revenge of the Fallen". It truly describes what i'm going thru now at work, but i'm not the bad ones. Just that i feel that i need to claim my territory & draw fine lines surrounding it, just in case. Actually, it's rather fun to work around people who fear to be kicked away from this company, especially when they finally have to think twice before stepping on your tail in situation like this. The retrenchment activities that are going on do not affect me at all. I will go when they give me the angpow. Unlike some other people whom i work with, who thinks himself/herself is The Great One. You can be the most important person in a function, but so what? You're not indispensable, esp when you're highly paid. If a fly is paid half your salary and flexible to do multiple jobs at one time, who would the company keep? Do you just hate people who love to claim credit for A-Z work? Or those who need to tell the whole world that he/she has lack of sleeps for god knows who many days just to get something done? Or people whom delete your name from your own mail?